As the capital of Malaysia, Kuala Lumpur has developed into a self contained city where one gets to enjoy the modern amenities and a better quality of life. In the midst of the business of city life, there are many tourist attractions and events that help one to unwind after a long days work. Many prefer to come during the weekends with their families just to enjoy the many attractions that are available in the city. Some of the attractions are the Aquaria KLCC, where one gets to enjoy the aquatic life without having to leave the city. It is located at the basement of Kuala Lumpur Convention Centre. There is also Petrosains, a discovery centre in Kuala Lumpur City Centre. National Planetarium with its wide screen cinema and other exhibits helps on to discover the field of astronomy. Details of the Kuala Lumpur tourist attractions can be found in the following links. Located within 5 minutes walking distance from Suria KLCC, this aquarium in the city features over 5,000 animals of 150 species of aquatic and land animals from Malaysia and around the world. 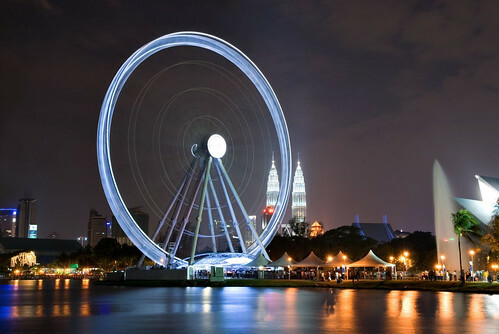 The first of its kind Ferris Wheel to be installed in this region, it is 60m in height and has 42 gondolas, all fully air conditioned for a comfortable ride. A full circle ride takes approximately 12 minutes to complete and each gondola can accommodate up to 8 people. If you are into art, come and visit Galeri Petronas at Level 3, Suria KLCC where exhibits of different themes and issues in Art and contemporary Malaysian society are featured here. See the exhibits of paintings, sculptures and other artistic work by artists from Malaysia and overseas on this premier art gallery in Kuala Lumpur. Visit the "tengkolok" shape National Library located at Jalan Tun Razak. Many educational resources and books are available here. Visit the Kuala Lumpur National Planetarium near Lake Gardens and see the exhibits on space exploration and asronomy. Remember to schedule some time to see the planetarium show. Visit this centre and explore the world of science and technology with your entire family. You will enjoy it. Discover science with your five senses at Petrosains Suria Kuala Lumpur City Centre. This interactive science discovery centre will be a thrilling experience for the entire family. Beyond the city of Kuala Lumpur, find the attractions that you can do with your entire family.. Youth and those young at heart will like this place where youth and movies related entertainment are the attractions here. This place is located appoximately 20 minutes by car from Kuala Lumpur. Visit the modern city of Putrajaya and cruise along the man made Putrajaya Lake as you enjoy the breathtaking scenery of the capital administrative city of Malaysia. I have booked into cheap Kuala Lumpur hotels so I can tramp through the city taking in the sights and the food (I love food!!). Last year I had gone to Kuala Lumpur with my friends and let me tell you that the lifestyle, food and tourist attractions in Kuala Lumpur are awesome..
Before traveling to KLC I have found 49 tourist attractions in Kuala Lumpur to visit. Majorly Asian cities are amazing to visit..I think god have added classic taste in that part.. I want to travel in Kuala Lumpur and experience the beautiful tourist attraction.